While the Supreme Court has ordered an injunction on the demolition until 11 July, the threat to the community - and other Palestinian communities just like it - remains. Friends of the Earth International urges world leaders and global allies to maintain pressure on Israel to prevent the illegal and ongoing destruction of Palestinian homes and schools. Khan al Ahmar is a Palestinian Bedouin village, inhabited by the Jahalin tribe, located in Area C of the West Bank, between the Israeli settlement of Ma’ale Adumim and one of its elite suburbs, Kfar Adumim. This places it within the E1 settlement block, which would join Ma’ale Adumin to annexed East Jerusalem, effectively confiscating large areas of Palestinian land for the benefit of Israeli settlers. The residents of Khan al Ahmar were forcibly relocated from the village of Tel Arad in the Negev Desert in 1951. They leased the land that they now live on from a private Palestinian landowner in Anata until it was expropriated and declared State land in 1975, then declared an industrial zone and later zoned for the settlement of Ma’ale Adumim. Residents of this community have very few sources of income left, suffer from a severe lack of health, education and welfare services, and live without basic infrastructure such as an electricity network, a sewage system and proper roads. Khan al Ahmar is just one of several Palestinian communities facing forced relocation because they fall within the E1 plan. 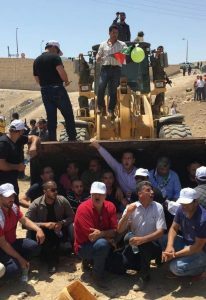 All the homes and structures in Khan al Ahmar were issued demolition orders on 5 March, 2017, requiring them to demolish their own homes, school, mosque, clinic, and barns within seven days. Israel has begun infrastructure work to facilitate the demolition and forcible transfer of residents with inhumane beatings of children, women, and elders. Friends of the Earth International stands with PENGON / Friends of the Earth Palestine in condemning Israel’s settlement policy and its plans to build more illegal settlements, along with all actions taken in that context - such as forced transfers, evictions, demolitions and confiscations of homes - to demolish Khan al Ahmar. These demolitions would be yet another violation of international law by Israel. We call on global leaders to put pressure on Israel to stop these actions, to immediately reverse these decisions, and fully meet its obligations to Palestinians as an occupying power under international humanitarian law.